The exterior of Loews Royal Pacific Resort. Image credit: Loews Hotels. What Is Loews Royal Pacific Resort? 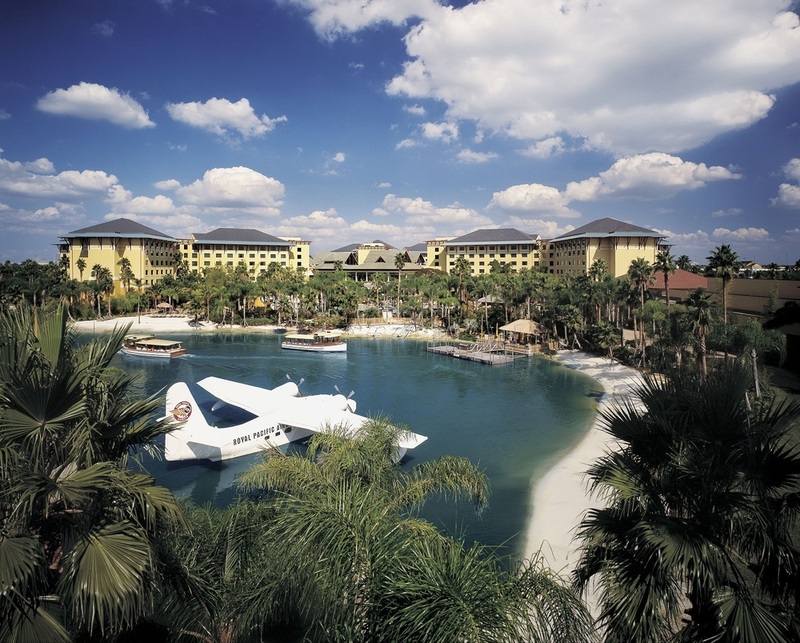 Loews Royal Pacific Resort is one of five on-site hotels at Universal Orlando Resort. This award-winning hotel opened in June of 2002 and has undergone two multi-million dollar renovations since then, including a $10 million room renovation in 2007 and a second complete room renovation completed in 2016. All of the on-site hotels at Universal Orlando Resort have an overarching theme, and Royal Pacific Resort is no exception. Guests who stay at this hotel are supposed to feel like they have journeyed to a South Pacific island. The South Seas theme is emphasized in the lush tropical surroundings of the Royal Pacific grounds, where you'll find palm and bamboo trees, a lagoon-style swimming pool, and a white sand beach. The exotic theme is also evident in the décor, which includes a stunning orchid court and hand-carvings straight from Bali. To gain more of an understanding of this hotel's beautiful theme, we recommend taking a 360 degree virtual tour of Loews Royal Pacific Resort. This tour will take you through all of the different rooms and suites as well as the inside and outside common areas. 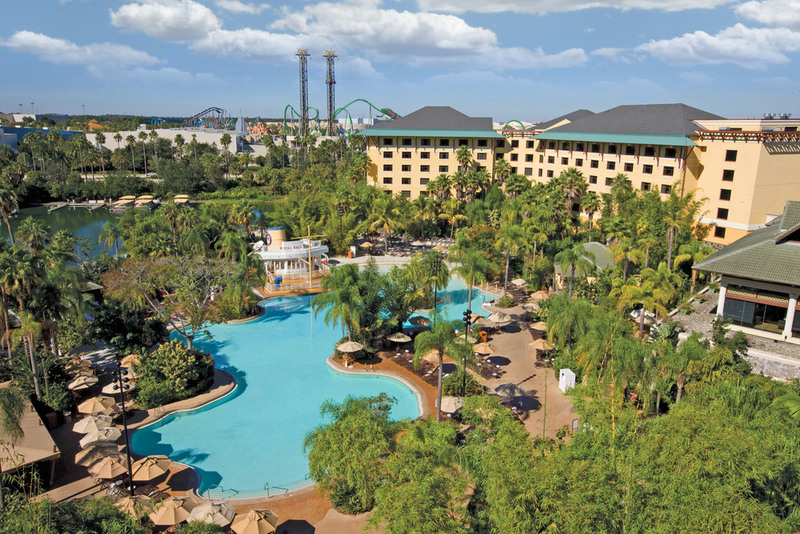 Loews Royal Pacific Resort is located on Universal Orlando property within walking distance of Islands of Adventure, Universal Studios Florida, and Universal CityWalk. You'll find it next door to Loews Sapphire Falls Resort, which is Universal's newest on-site hotel. Loews Royal Pacific Resort standard room with two queens. Image credit: Loews Hotels. Loews Royal Pacific Resort standard king room. Image credit: Loews Hotels. Loews Royal Pacific Resort King Suite. Image credit: Loews Hotels. Loews Royal Pacific Resort Jurassic Park Kid's Suite. Image credit: Loews Hotels. 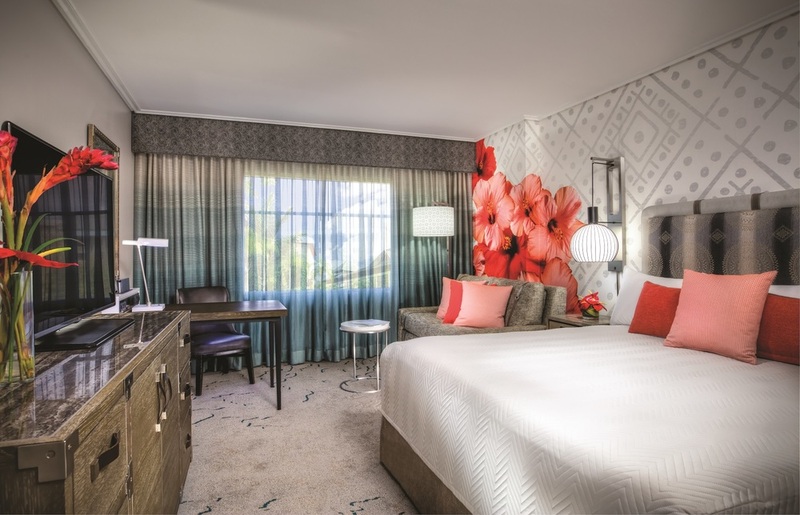 Standard Room: Each standard room at Loews Royal Pacific Resort has 335 square feet of space. You can choose from a standard room with one king bed or a standard room with two queen beds. King rooms have a maximum occupancy of three people; queen rooms have a maximum occupancy of five people. Water/Pool View Rooms: These rooms are exactly the same as standard rooms, but offer views of the pool, the stream surrounding the hotel, or the waterway that connects the hotel to the theme parks. You can choose from a room with a single king bed or a room with two queen beds. King rooms have a maximum occupancy of three people; queen rooms have a maximum occupancy of five people. Royal Club: Also known as Club Level rooms, the Royal Club rooms offer 335 square feet of space, garden or water views, and additional amenities, including access to the exclusive Royal Club Lounge, a 2,000 square foot space on the seventh floor. This lounge offers personal concierge services, complimentary computer and internet use, and reduced prices on cabanas. Other free perks include continental breakfast (7:00 am to 10: 00 am), afternoon snacks (12:00 pm to 3:00 pm), hors d'oeuvres, beer and wine (4:30 pm to 6:30 pm), and a sweets hour (8:00 pm to 9:00 pm). You can choose from a room with a single king bed or a room with two queen beds. King Royal Club rooms have a maximum occupancy of three people; queen Royal Club rooms have a maximum occupancy of five people. King Suite: The Royal Pacific king suites have 670 square feet of space that is split between a large bedroom with a king bed and a separate living area with a desk, sofa, and other seating space. King suites have a maximum occupancy of three people. 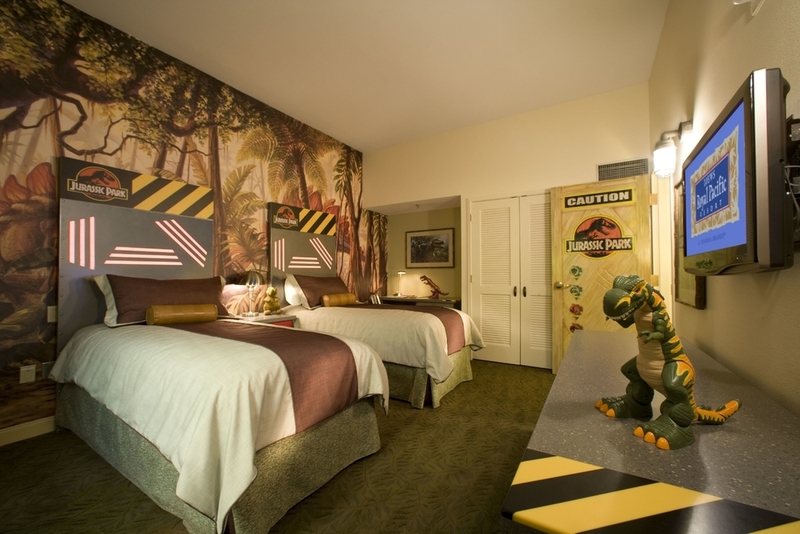 Jurassic Park Themed Kid's Suite: The 670 square foot kid's suites at Royal Pacific are ideal for families. There are two bedrooms, one with a king bed and another with two single beds and seating areas for the kids. The second bedroom has a fun Jurassic Park theme and opens into the king bedroom but not the hallway. Jurassic Park kid's suites have a maximum occupancy of five people. Hospitality Suite: Royal Pacific Resort has two types of hospitality suites. One has a single bedroom with a king bed or two queen beds and 670 square feet of parlor space. The other has two bedrooms (one with a king bed and the other with two queen beds) and 670 square feet of parlor space. The maximum occupancy for one-bedroom hospitality suites is five people for a king room and seven people for a queen room. The maximum occupancy for two-bedroom hospitality suites is ten people. Royal Suite: The Royal Suites at Royal Pacific Resort are located in the seventh floor. These rooms have a large parlor with seating areas and a pull out sofa and connect to either a single room with a king bed or a single room with two queen beds. 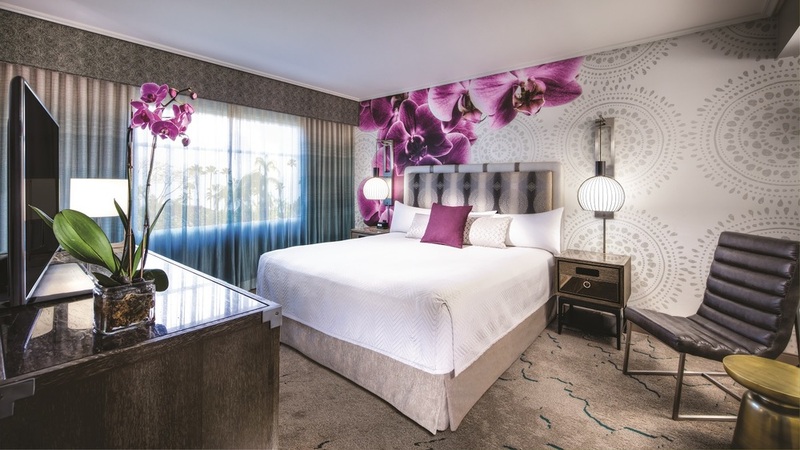 There is also the option of getting a suite with a parlor that connects to two different bedrooms: one room with a king bed and one room with two queen beds. Guests who stay in royal suites have access to the Royal Club Lounge and all of the amenities (like free food and drinks) that come with it. Maximum occupancy for a royal suite with a king bed is five people, while the maximum occupancy for a royal suite with two queen beds is seven people. Royal suites that attach to two bedrooms have a maximum occupancy of 10. Captain's Presidential Suite: The fanciest room that you can book at Royal Pacific Resort is the presidential suite. This suite features a dining area, conference area, study area, service pantry, one and a half bathrooms, Whirlpool tub, and one king bedroom to create 1,340 square feet of space. This suite can also be booked with a connecting room with two queen beds and a second connecting room with a king bed. Booking the suite with two connecting rooms gives you 2,010 square feet of space and a maximum occupancy of 10 people. It is important to note that all of the rooms (and rates) at Loews Royal Pacific Resort are based on double occupancy (two people per room). Children who are staying with two adults can stay for free. But multiple adults (more than two) will need to pay an extra fee of at least $25 per person per day. For example, if you have four adults in a single room with two queen beds, you will need to pay for the room plus $25 extra per day for the third adult and $25 extra per day for the fourth adult. Some rooms, including standard rooms with two queen beds, have a maximum occupancy of five people: two per bed and one person on a rollaway. There is an extra charge of $25 per day for the rollaway. So if you have five adults staying in one room, you would need to pay the regular room rate plus $25 extra per day for the third adult, $25 extra per day for the fourth adult, and $25 extra per day for the fifth adult on the rollaway. Room rates at Royal Pacific Resort depend on the type of room you get. Standard rooms are the cheapest. Rooms with water or pool views cost a little more. And suites are the most expensive of all. The other factor that influences room rates is the time of year that you travel. Royal Pacific Resort has seasonal rates, which means that some seasons (i.e. non-busy seasons) are cheaper than others. Rates are often cheapest during parts of January, February, August, and September. They are often most expensive during the busy seasons and near the holidays. Loews hotels have a special program known as the Loews Loves Pets Program. This program allows guests to bring their pets along with them to Loews Royal Pacific Resort. Each pet staying at the hotel gets a small welcome gift upon check-in. All pets staying with Loews must be less than 75 pounds and up to date on all required vaccinations. A nightly fee of $50 will be added to your room rate; this fee maxes out at $150 per stay. There is a maximum of two pets allowed per room. Call 407-503-3000 to learn more about the Loews Loves Pets Program. Guests who are staying at Loews Royal Pacific Resort can also get daily newspaper delivery, complimentary turndown service, free overnight shoe shine service, and a safety deposit box upon request. 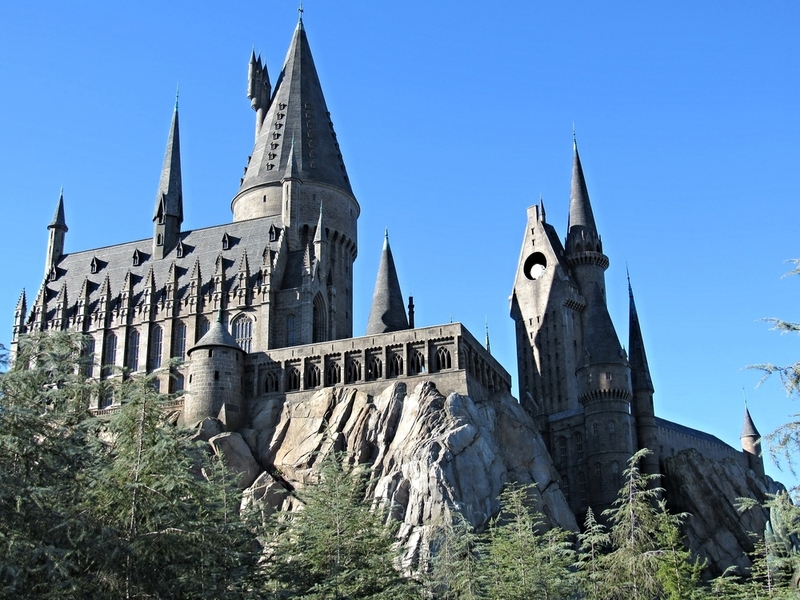 Guests at Loews Royal Pacific Resort get early entry to The Wizarding World of Harry Potter. Free Universal Express Unlimited. Every guest staying at Royal Pacific receives an Express Pass that can be used to skip the regular lines for rides and shows at Universal Studios Florida or Islands of Adventure. Since you won't have to wait in long lines, you will be able to do more things on your trip. The Express Passes are one of the most valuable free amenities that you get from this hotel. (Note: Some attractions, including Harry Potter and the Forbidden Journey, Harry Potter and the Escape From Gringotts, Pteranodon Flyers, and Kang and Kodos' Twirl 'n' Hurl, do not accept Express Passes). Priority seating at restaurants. All Royal Pacific guests get priority seating at select restaurants throughout Universal Orlando Resort. 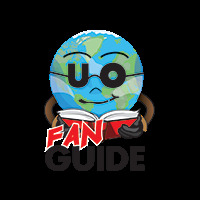 Free Access to CityWalk venues. Some live entertainment venues at Universal CityWalk, including the Red Coconut Club and CityWalk's Rising Star have a cover charge. Staying at Royal Pacific Resort gets you complimentary entry to these venues for the duration of your stay. Resort-wide charging privileges. Merchandise, food, and other purchases throughout the hotel, theme parks, and CityWalk can be charged to your Royal Pacific Resort room key. All purchases must be paid for upon check-out. Free merchandise delivery to your room.The merchandise you purchase in Universal Studios Florida or Islands of Adventure can be delivered to your Royal Pacific Resort room so that you don't have to carry it or store it in a locker. Complimentary water taxi and shuttlebus transportation. You can easily walk to the parks from Loews Royal Pacific Resort, but you don't have to. You can board a water taxi or a bus that will take you from Loews Royal Pacific Resort to CityWalk, which is located right next to both theme parks. The free transportation services also take you from CityWalk to Loews Royal Pacific Resort. Water taxis and shuttlebuses begin running early in the morning before the parks open and run continuously throughout the day until shortly after CityWalk closes. CityWalk closes at 2:00 am; the transportation runs until almost 2:30 am. Complimentary shuttlebus transportation to nearby attractions like SeaWorld, Aquatica, and Wet 'n Wild. If you want to go to a nearby destination, you can get a free scheduled ride on a shuttlebus. The complimentary shuttlebuses pick you up in CityWalk in an area between CityWalk and the Universal parking structure and drop you off in the same spot after you have visited your desired destination. Complimentary wake-up call. Royal Pacific guests can get a complimentary wake-up call from one of their favorite Universal Orlando characters. Golf Universal Orlando. All on-site hotel guests, including Royal Pacific guests get preferred tee times and complimentary transportation (parties of four or more) to Grand Cypress Golf Club through the Golf Universal Orlando program. Loews Royal Pacific Resort pool. Image credit: Universal Orlando Resort. Loews Royal Pacific Resort has a very large lagoon-style swimming pool with a white sand beach. Complimentary lounge chairs and towels are provided. You can also rent a private cabana for an additional charge. Cabanas are outfitted with a fan, TV, and a refrigerator stocked with bottled water, soda and fruit. Reservations are required. You can call 407-503-3235 to make reservations or learn more about cabana prices. Some of the things that you will find near the pool include two different hot tubs, an interactive play area for children, and a beach volleyball court. The hotel also offers organized poolside activities like ping pong tournaments, shuffleboard, swimming pool basketball, arts and crafts, hula hoop contests, and a dive-in movie that plays near the pool after dark. Guests can check with the front desk to learn more about poolside activities that are scheduled during their stay. Jake's American Bar is open for lunch, dinner, and late night drinks. The food is distinctly American themed. The lunch menu at Jake's American Bar includes menu items like wings, burgers, salads, and pizza. Jake's dinner menu includes more of the same along with steaks, ribs, and seafood. Guests can also order off a dessert menu with unique offerings like churro bread pudding and panini ice cream sandwiches or a kid's menu with simple dishes like hot dogs and chicken tenders. For many people, the drinks are the real draw of Jake's American Bar. Beverage offerings include wine, cocktails, and a wide range of beers. The restaurant also offers something known as Jake's Beer Dinner, which pairs four courses with specialty beers, as well as a twice annual beer festival with food, live entertainment, and a selection of about 50 craft beers. Islands Dining Room at Loews Royal Pacific Resort. Image credit: Loews Hotels. This Royal Pacific restaurant sticks with the Pacific Island theme by offering Pan Asian Cuisine for breakfast, lunch, and dinner. There is a daily breakfast buffet and an Islands breakfast menu with traditional and island themed dishes. Dinner is served from 11:00 am to 10:00 pm. The extensive Islands Dining Room dinner menu contains dishes like spring rolls, pot stickers, Mongolian beef, and Kung Pao chicken as well as tempting dessert offerings like a homemade pineapple doughnut and a five spiced caramelized banana cream pie. The Islands Dining Room is probably the most kid-friendly dining option at the hotel. Kids can sit in the main dining room or in a special dining room just for kids. The kid's room is appointed with child sized seating, a TV, and Fisher Price toys. No matter where they sit, youngsters can order off a breakfast menu for kids or a dinner menu for kids with everyday options like hots dogs, pizza, and grilled cheese. Private dining is available as well in a room that seats up to 50 guests at one time. You can call 407- 503-3410 to learn more about private dining costs and menu offerings. The Orchid Court Lounge is on the lobby level near the Orchid Court, which contains a reflecting pool and more than 400 blooming orchids. As you might imagine, the decor in this lounge is exceptionally pretty. Guests are surrounded by hand-carved furniture and Bali sculptures. The Orchid Court Lounge serves Starbucks coffee and a continental breakfast every morning. In the afternoon and evenings, you can get hand-mixed cocktails and food like spring rolls, dumplings, burgers, and Asian chopped chicken salads. See the full Orchid Court Lounge menu to learn more about food offerings in the afternoon and evenings. The Orchid Court Sushi Bar is part of the Orchid Court Lounge. This bar has a very large sushi menu with nigiri, sashimi, and sushi rolls. 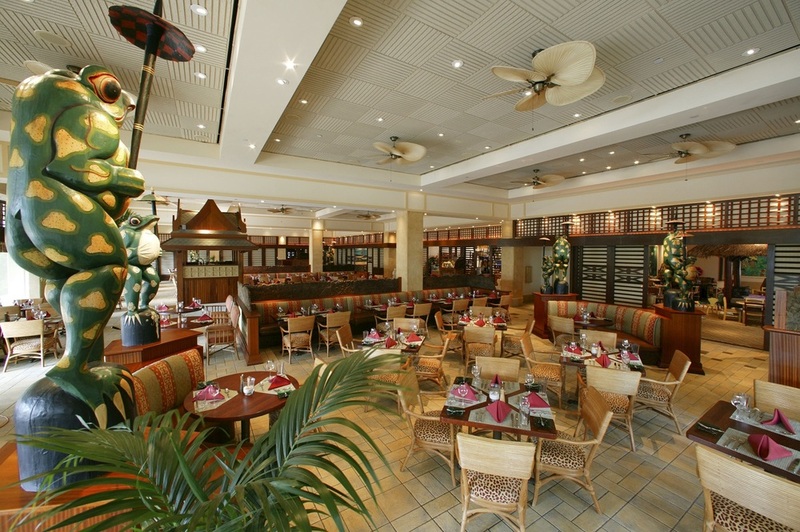 The Bula Bar and Grille is a casual outdoor restaurant that is located alongside the pool. Outdoor seating includes a tiki bar as well as shaded tables. Menu items include burgers, sandwiches, tropical drinks, and soda. You can also get ice cream, shakes, and related fare from the nearby Bula Ice Cream Shop (opened seasonally). See the everyday Bula Bar and Grille menu. Fun fact: Bula means "welcome" in Fijian. Guests at Loews Royal Pacific can also dine in their rooms by ordering off the extensive 24-hour room service menu. Character dining at Loews Royal Pacific Resort. Image credit: Loews Hotels. 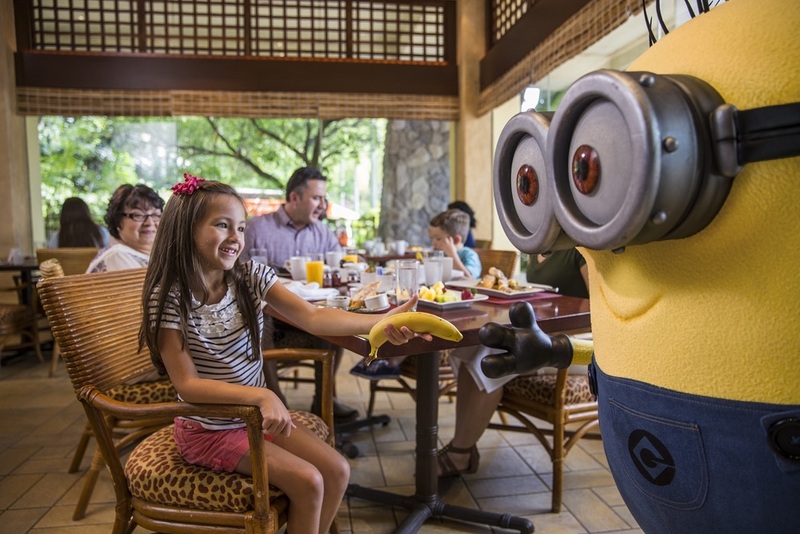 Loews Royal Pacific Resort offers the chance to have breakfast with Universal characters on Sunday mornings. This Character Breakfast includes food and a character meet and greet. You don't need to be staying at the hotel to take part in the Character Breakfast, but seating is limited, so we highly recommend making reservations. You can make Islands Dining Room reservations online or by calling 407-503-3463 (DINE). Toko Gifts: This is the place to buy apparel with the Loews Royal Pacific Resort logo on it. The store also sells theme park merchandise, Universal apparel and souvenirs, toiletries, sunscreen, and other things you may have forgotten to pack. Treasures of Bali: You can find beachwear and casual resort wear at the Treasures of Bali. The store also sells snacks, imported gifts, and souvenirs. Mas: This Royal Pacific Resort store is a fun place to shop for unique gifts like custom wood carvings, mirror mosaics, and other on-of-a-kind souvenirs. Parents who want to get away without the kids can take advantage of the Resort Kids Camp. This babysitting service/activity center charges $15 per child per hour plus an additional $15 per meal. The camp opens at 5:00 pm. Closing times vary depending on the day and the season. You can call 407-503-1200 for more information or to make reservations for your child. Wantilan Luau Pavilion at Loews Royal Pacific Resort. Image credit: Loews Hotels. The Wantilan Luau is a weekly event that takes place every Saturday night at Loews Royal Pacific Resort. This family-friendly luau combines entertainment like traditional hula dancing, fire dances, and Hawaiian singing with an all-you-can-eat Polynesian buffet. The buffet includes food like pit-roasted suckling pig, beef flank steak, seafood, and tropical fruit. Drinks like beer, wine, Mai Tais, and non-alcoholic beverages are also included. Kids have their own buffet with food that is a little more kid-friendly. The Wantilan Luau a separately ticketed event takes place under a pavilion that seats about 240 people. Reservations are required to attend. Learn more about Wantilan Luau prices and reservations. You can visit the Loews website to learn more about Royal Pacific Resort meeting and function space. There is a fee to park in one of the 1,200 parking spaces at Royal Pacific Resort. Self-parking is $22 plus tax per day for overnight guests and $45 plus tax per day for day guests. Valet parking is $29 plus tax per day for overnight guests and $45 plus tax per day for day guests. Many of the hotel's on-site restaurants can validate parking so that you do not have a fee. Call the restaurant ahead of time to see if validation is available. The Orlando International Airport is less than 20 miles from Loews Royal Pacific Resort. These driving directions will get you to the hotel. If you do not have a car, you can use Universal's SuperStar Shuttle. This shuttle service is not free, but it is cheaper than most of the other shuttle services that make the trip from the airport to the hotel. Kids under age three can ride for free. You can call Universal Travel Operation Department at 866-604-7557 to make the required shuttle reservation. Other fee-based shuttle services in Orlando include Mears Transportation and SuperShuttle. 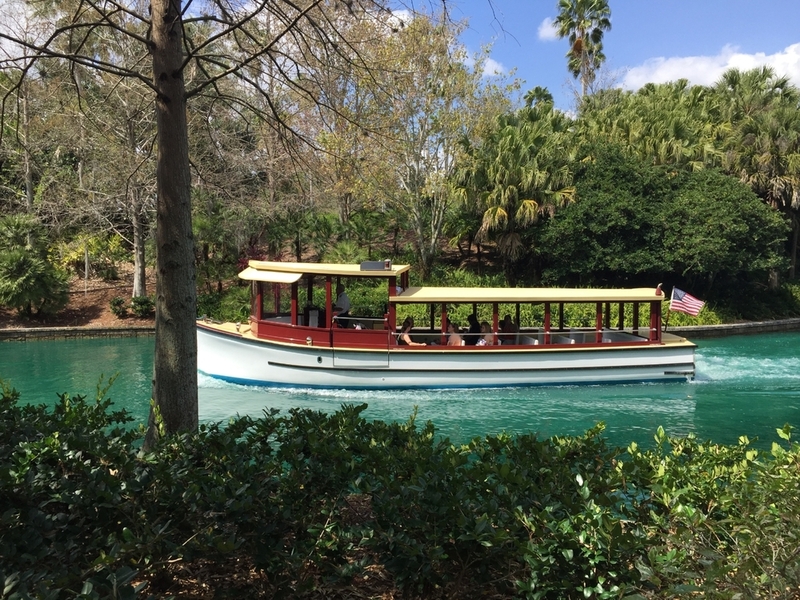 The free water taxi taking guests from CityWalk to Loews Royal Pacific Resort. Ride the Free Water Taxi. There is a free water taxi that takes guests from the lagoon at Royal Pacific Resort to the lagoon in CityWalk, where it is just a short walk to either theme park. The water taxi runs continuously throughout the day from early in the morning (before the parks open) until about 2:30 a.m. (CityWalk closes at 2:00 am). The water taxis also travel from CityWalk back to Royal Pacific Resort, so it is really easy to catch a ride back to the hotel at any point during the day. Wait times for water taxis are usually just a few minutes. Ride the Free Shuttlebus. A complimentary shuttlebus also runs from Royal Pacific Resort to the bus drop-off at the entrance to CityWalk (near the Universal parking structure) from early in the morning (before the parks open) until very late at night (about 2:30 am.) The drop off area for the shuttlebus is not as close to the theme parks as the water taxi lagoon or the garden path exit. However, it will take you just a few minutes to walk from the drop off area to the theme park gates. Walk. There is a very nice garden path that will take you from Loews Royal Pacific Resort to a side entrance in CityWalk that comes out near Islands of Adventure. Depending on how fast you walk, this path will get you from the hotel gate to CityWalk in just 5-10 minutes. Walking is often the quickest way to get to the theme parks because you don't have to wait to board a bus or a water taxi. Loews Royal Pacific Resort lagoon. Image credit: Loews Hotels. Booking a room at Loews Royal Pacific Resort is a simple process. You can make reservations over the phone by calling 1-888-430-4999. There is also the option of booking online through the Loews Hotels website or through booking engines like Expedia.com, where you can save with Expedia coupons and offers. If you'd like to book a room and theme park tickets at the same time, you can do so through UniversalOrlandoVacations.com. There are also many knowledgeable travel agents who can do all of the booking work for you. These agents may be able to get you special discounts or help you take advantage of promotions. YouFirst Rewards is the Loews loyalty program. This free program offers benefits to guests of Royal Pacific Resort and other Loews hotels (Cabana Bay Beach Resort and Hard Rock Hotel do not participate in this program). Benefits include late checkout and free room upgrades after just two stays. The more you stay, the more benefits you receive. After 10 stays, you achieve Platinum Status, which includes benefits like guaranteed availability and food and beverage credits. There are five different on-site hotels at Universal Orlando Resort. The Loews Royal Pacific Resort is a Preferred Hotel. This basically means that it is usually more expensive than Cabana Bay Beach Resort, which is a Prime Value Hotel, but cheaper than Hard Rock Hotel or Lowes Portofino Bay Resort, which are both Premier Hotels. The only other Preferred Hotel on property is Lowes Sapphire Falls Resort. Most of the on-site hotels have the same theme park benefits. But there are a few exceptions to this rule. Most notably, you must stay at Hard Rock Hotel, Lowes Portofino Bay Resort, or Lowes Royal Pacific Resort to get free unlimited Universal Orlando Express Passes. These passes do not come with rooms at Lowes Sapphire Falls Resort or Cabana Bay Beach Resort. Express Passes are valued at $89 per person per day. However, you can usually buy these passes for less on days when the park is not busy. The Orchid Court at Loews Royal Pacific Resort. Image credit: Loews Hotels. On select nights, Royal Pacific Resort has a nighttime torch lighting ceremony that incorporates fire dancers and an "Oli Aloha" welcoming chant. There is a 5,000 square foot space known as The Gymnasium that is free for guests of Royal Pacific Resort. The Gymnasium features a fitness center with workout equipment, a steam room, a sauna, locker rooms, and a co-ed whirlpool tub. All Royal Pacific guests have access to a full-service business center that is open Monday through Saturday. Guests can hold their wedding ceremony and reception at Royal Pacific Resort. The hotel offers signature weddings as well as more intimate weddings. Be sure to check out the unique Orchid Court, which features 20 to 30 different types of orchids situated around a large reflecting pool. There is a Hertz Rental Desk near the hotel's Attraction Ticket Center. You can rent a car at this desk and save up to 20% on the rental fee as a guest of Royal Pacific Resort. Royal Pacific guests can use the free Universal dining shuttle to visit restaurants at other Universal on-site hotels. If you want to check out the pools at the other on-site hotels, you can use your Royal Pacific room key to enter the pool area at any hotel. Royal Pacific Resort is a non-smoking property, but you can find designated outdoor smoking areas on hotel property. There is a 12.5% tax on all rooms at Royal Pacific Resort. See pictures of Loews Royal Pacific Resort in this image gallery.